This quiet CL, situated less than 10 minutes from the Ferry Terminal at St Margaret’s Hope, is run by Club members Cindy De Battista and her husband Alan. Alan has worked giving guided tours around Orkney, so he is very happy to answer any questions that you may have about Orkney’s attractions, although information folders and a complimentary visitor newspaper are also available at the site to help you plan your excursions. No part of the main island (called Mainland) is very far away and the site makes an excellent base for visiting all the attractions of Orkney with the capital city Kirkwall, and the magnificent St Magnus Cathedral, just 30 minutes away across the Churchill Barriers. 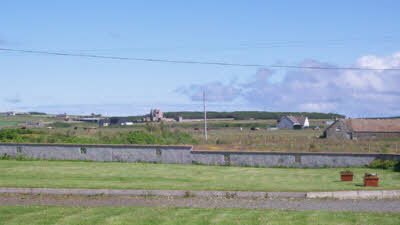 The site occupies an elevated position, with breath taking 180 degree sea views of the east coast of South Ronaldsay and the connected South Isles, looking out to the Island of Copinsay and the Grim Ness. Electric hook is supplied as standard and the hard standings are arranged mainly in bays with an extended hard standing area that is particularly suited to larger motor homes. Visitors are encouraged to use the waste recycling facilities available in the service compound on site and a composting system is installed for waste food items. A W.C. and chemical toilet disposal point is situated in the car park. Orkney is a birdwatchers paradise. 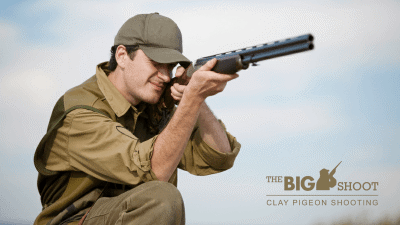 At certain times of the year, the area around the site is particularly rich in birdlife and sightings of Short Eared Owl and Hen Harrier are not uncommon in the surrounding farmland. In addition to the wildlife, stunning scenery and skyscapes, Orkney’s well preserved archaeological sites will take you back thousands of years to see evidence of the very first settlers and their descendants that came to Orkney when the ice retreated. The homes and monuments these people created can be seen today although they predate the Egyptian pyramids! Although B and B is no longer available at the farmhouse we do have a 5 berth unit and awning set up about 50m from the CL which is available for self catering stays or additional members of the family from £30 per night inclusive of electricity, bedding etc. Some members have found this ideal for short explorative visits to Orkney rather than bring their own unit across on the ferry although there is an additional charge for laundry if the stay is less than 3 nights. Please do not hesitate to contact us for any further information. We look forward to welcoming you to Orkney! Museum and visitor centre within the churchyard of a medieval church. The visitor centre has galleries telling of Tain's rich history from the life of Saint Duthac to the town's involvement in the capture of Robert The Bruce's family through to the many pilgrimages of King James IV of Scotland. We stayed here for 4 nights on our recent epic journey north from the Midlands to Orkney staying at caravan club sites a long the way. This was our base on Orkney and was very convenient for exploring the South Islands and the Mainland. 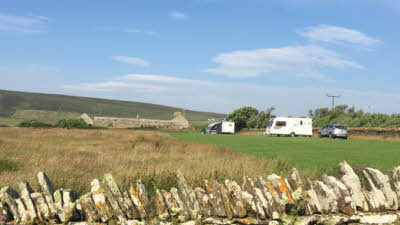 A lovely site to stay at in an excellent location, great view and friendly owner. Sink and toilet if needed a short walk from pitches. Pitches were great and good size. Nice flowers and landscaping. The location really made it. A short drive off the ferry and amenities and lots of places of intetest only a short drive away. Couldn't recommend it more! Stayed one night and went back again. Welcoming and beautifully kept gardens with all needs thoughtfully provided. The views are spectacular and sunrise on our last morning was stunning. Perfect for exploring the south of the island. Would not hesitate to return. We stayed here for 3 nights as part of our Orkney adventure. A lovely site overlooking the sea, we had an enjoyable walk down to the beach and along the coast one day and then took the van down to the Tomb of Eagles the next (a fascinating place). There is a toilet and sink if you need it. The farm has chickens and lots of wild rabbits, and we spotted a short-eared owl, Curlews and Oystercatchers from our pitch. Very friendly owner and a warm welcome. Stayed on this site for over 5 weeks whilst finding and buying a house, and couldn't have asked for more lovely views or nicer people. Cindy works hard to keep the site tidy and is always gardening. 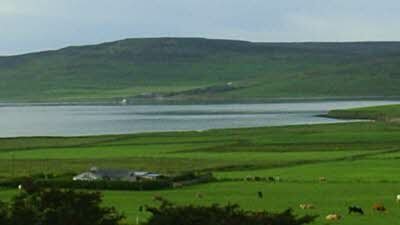 Perfectly situated for touring the whole of the Orkneys you couldnt want better than this for a small peaceful site. As previous reviewers have said, this is a pretty site overlooking an extensive sea view. The owners have put in a lot of work to produce the result we now see. All pitches are hard standing, the gardens are lovely, and there are even benches next to each pitch. The recycling facilities are comprehensive and innovative. We enjoyed being awakened by a cockerell at 7am. It makes for an early start to whatever you have planned!